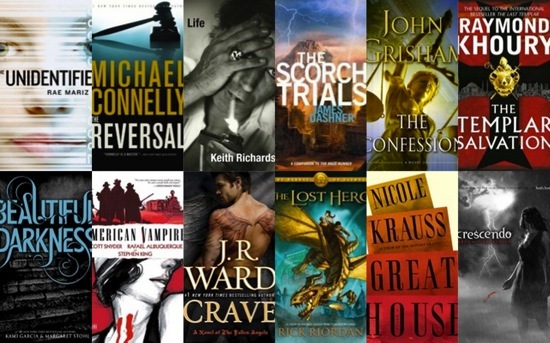 October is here and that means new books from big name authors like Michael Connelly and John Grisham. Teens also have a lot to look forward to as many of the upcoming book releases this month are highly anticipated YA books. So check out the October books I think you’ll be interested in. Isaac Rothe is a black ops soldier with a dark past and a grim future. The target of an assassin, he finds himself behind bars, his fate in the hands of his gorgeous public defender Grier Childe. His hot attraction to her can only lead to trouble-and that’s before Jim Heron tells him his soul is in danger. Caught up in a wicked game with the demon who shadows Jim, Isaac must decide whether the soldier in him can believe that true love is the ultimate weapon against evil. This volume follows two stories: one written by Snyder and one written by King. Snyder’s story is set in 1920’s LA, we follow Pearl, a young woman who is turned into a vampire and sets out on a path of righteous revenge against the European Vampires who tortured and abused her. This story is paired with King’s story, a western about Skinner Sweet, the original American Vampire– a stronger, faster creature than any vampire ever seen before with rattlesnake fangs and powered by the sun. Kid has a vague sense of unease but doesn’t question this existence until one day she witnesses a shocking anticorporate prank. She follows the clues to uncover the identities of the people behind it and discovers an anonymous group that calls itself the Unidentified. Intrigued by their counterculture ideas and enigmatic leader, Kid is drawn into the group. But when the Unidentified’s pranks and even Kid’s own identity are co-opted by the sponsors, Kid decides to do something bigger—something that could change the Game forever. This funny, sharp, and thought-provoking novel heralds the arrival of a stunning new voice in teen fiction. Constantinople, 1203: As the rapacious armies of the Fourth Crusade lay siege to the city, a secretive band of Templars infiltrate the imperial library. Their target: a cache of documents that must not be allowed to fall into the hands of the Doge of Venice. They escape with three heavy chests, filled with explosive secrets that these men will not live long enough to learn. Vatican City, present day: FBI agent Sean Reilly infiltrates the Pope’s massive Vatican Secret Archives of the Inquisition. No one but the Pope’s trusted secondi get in-but Reilly has earned the Vatican’s trust, a trust he has no choice but to violate. His love, Tess Chaykin, has been kidnapped; the key to her freedom lays in this underground tomb, in the form of a document known as the Fondo Templari, a secret history of the infamous Templars… With his trademark blend of incendiary history and edge-of-your-seat suspense, Raymond Khoury’s The Templar Salvation marks a triumphant return to the rich territory that launched his bestselling career. The long-awaited autobiography of the guitarist, songwriter, singer, and founding member of the Rolling Stones. Ladies and gentleman: Keith Richards. Now, at last, the man himself tells his story of life in the crossfire hurricane. Listening obsessively to Chuck Berry and Muddy Waters records, learning guitar and forming a band with Mick Jagger and Brian Jones. The Rolling Stones’s first fame and the notorious drug busts that led to his enduring image as an outlaw folk hero. Creating immortal riffs like the ones in “Jumping Jack Flash” and “Honky Tonk Women.” His relationship with Anita Pallenberg and the death of Brian Jones. Tax exile in France, wildfire tours of the U.S., isolation and addiction. Falling in love with Patti Hansen. Estrangement from Jagger and subsequent reconciliation. Marriage, family, solo albums and Xpensive Winos, and the road that goes on forever.